Over half of the plant species that exist in Norway today have been transported here by humans. Every year, 20,000 tons of perennials, shrubs and trees are imported to Norway. 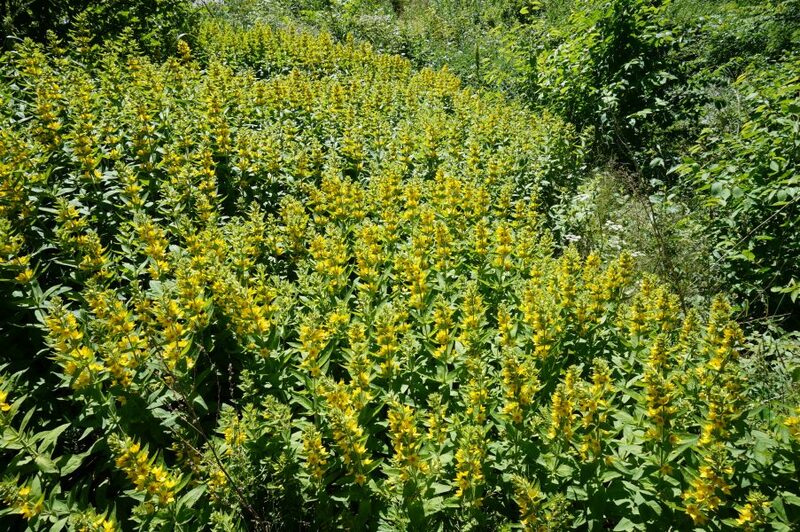 Not all introduced garden plants pose a threat to Norwegian nature and indigenous species, but we have seen examples of species becoming invasive (like the Garden Lupin), and we know of several species that may become invasive. Invasive species threaten biodiversity by invading new areas and changing the habitat and species composition. In cases where the spread proceeds undisturbed, these invasive species can completely outcompete the local indigenous species, reduce diversity and establish monocultures. Such drastic changes also affect insects, animals and birds in addition to the flora. Of all the alien plant species spreading in Norwegian nature, 40% of them originally escaped from gardens. The most effective measure against alien invasive species have proven to be simply preventing introduction and the subsequent spread into nature. For this reason, a ban to import, sell and distribute/relocate/move 17 different plant species that are considered to have a severe negative effect on Norwegian nature was introduced in 2016. Overview of the illegal species can be found here. If you’re a garden owner, it means you can not plant these 17 species in your garden. While it’s not illegal to have one of the species in your garden if it had already been established there before 2016, you have to take responsibility to prevent the plant spreading outside your garden. In such cases, flowers must be removed before the seeds mature (berries and rose hips must also be removed) and physical barriers must be established for sprouting species. Many people dump garden waste on roadsides, forest edges or outside their garden fence and believe that it will rot and disappear by itself. This is NOT the case and it is actually illegal! A small piece of a root, plant part or a single seed is enough for one of your garden plants to set root outside of the fence and damage Norwegian ecosystems. A hot compost is a good option that ensures plant propagules are killed. Yet it is still not completely safe for preventing spreading of alien invasive plant species. Some species like Japanese knotweed can survive even in hot compost, and there is also a chance that seeds will survive if the plants in the compost carry fruits or seeds. The safest option is always burning. It is not just this spreading of alien plant species that is accelerated by dumping garden waste in nature. Garden plants, including those that are not a threat to nature, can carry different types of bacteria, fungi, insects and viruses, which can spread throughout Norwegian nature by the dumping of garden waste. You may have heard about the fungus-like plant pathogen called Phytophthora ramorum, which came to Europe as a blind passenger on rhododendron shrubs from Asia. In Asia, the shrubs have resistance to the pathogen, while Norwegian trees and shrubs lack resistance and will quickly die from the attack. In England, this pathogen has created huge problems for blueberry and leek forests. In Norway, the pathogen has already been discovered in Rogaland, and it is feared that it will create an even bigger problem than both the Spanish slug and Lupin. Fortunately, there are good alternatives to the dangerous, exotic garden plants. Use substitute species that cannot settle outside the garden fence, or Norwegian native plants that are good for the local fauna. Examples of replacement species can be found here and here. By using indigenous/native/local species you don't need to worry about plant diseases to such an extent, but you have to take care not to pick vulnerable or endangered species in the wild! For more information about invasive garden plants, we invite you to read the following study (text in Norwegian).